"Becky Lynn Hawkes, Westbrook College, Class of 1977"
Westbrook College student Becky Lynn Hawkes, Class of 1977, was a Medical Assistant major and a Day Hop. For her senior class candid photo, which appeared in the 1977 Tower Yearbook, she wore a bright, psychedelic jersey with three-quarter length sleeves and dark, velvet slacks. Her hair was long, parted on the side and fell loosely over her shoulders. 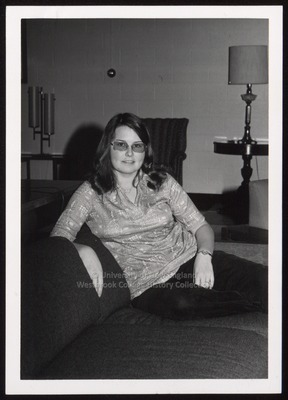 Becky sits on a sofa within a resident hall lounge.